(CNN) -- The American International Group debacle could be setting President Barack Obama up for trouble, should his administration try to move forward with additional bailouts. President Obama says he will try to block bonuses for AIG executives. Echoing the sentiment of taxpayers, the president on Monday called the ailing insurance giant's plans to dole out $165 million in bonuses an "outrage" and said he would attempt to block the additional compensation. AIG, one of the big beneficiaries of the government bailout, is now nearly 80 percent owned by taxpayers. David Gergen, a senior political analyst for CNN, said the AIG controversy could be a "turning point" in Obama's efforts for bailouts "in the sense that this is igniting so much public anger." "I think the president is in an awkward position, because he wants and he may need to continue bailing out big banks, big institutions, the car companies. But there's so much anger over this that people may say: 'The hell with it. I don't care what happens to these people. Let them go. They are abusing us. They're taking our money and exploiting it,' " he said. Last year, Congress approved a $700 billion Troubled Assets Relief Program bailout to stabilize the financial sector. AIG came under attack in October when it spent hundreds of thousands on a retreat for executives after it accepted the billions in bailout funds. AIG maintained that most of the event was paid for by the participants and partners at the conference. Borger: Where's the White House's tipping point? AIG, which has more than 74 million insurance policies issued in 130 countries around the world, lost a record $62 billion in the fourth quarter of 2008. After reporting the losses, AIG received another $30 billion from the Treasury Department. 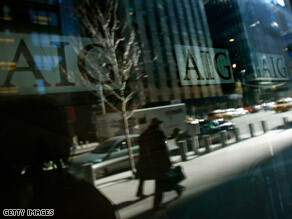 AIG has received at least $170 billion in federal bailout money. AIG paid 73 employees bonuses of more than $1 million each, New York Attorney General Andrew Cuomo informed Congress in a letter Tuesday. The largest bonus paid was $6.4 million, and seven more people received more than $4 million each. Eleven AIG executives who were paid million-dollar retention bonuses went on to quit the company, Cuomo said. Rep. John Boehner, the top Republican in the House, said Tuesday that the Obama administration should have asked questions before giving the company additional funds. "Not one word has been said about solving the problem," said Boehner, R-Ohio. Speaking on the Senate floor Tuesday, Minority Leader Mitch McConnell also said the White House should have spoken up sooner. Referring to the AIG bonuses, he said, "Many of us expressed absolute outrage. And yesterday, the White House joined that chorus and promised to do everything possible to get the taxpayers' money back. "I appreciate their efforts. However, it would have been better if this pledge included action two weeks ago when the Treasury agreed to give AIG another $30 billion in taxpayer money," said McConnell, R-Kentucky. "Wouldn't the Treasury and the taxpayer have had more leverage over AIG's executive contracts before providing another $30 billion in taxpayer money rather than allowing the bonuses to be paid with taxpayer money?" The Bush administration came under criticism for a lack of transparency and accountability in spending the first half of the TARP funds. Obama has promised to do a better job with the second half of the funds, but analysts say he'll be hard pressed the get the public behind him. In addition to the remaining TARP funds, Obama's 2010 budget leaves open the possibility for another $750 billion in bailout money. Even before the fallout over misuse of the bailout funds, the public was sour on the idea of a bailout. It took two weeks of contentious and emotional debate in Congress before President Bush was able to sign the legislation into law. Five days of unprecedented worldwide reporting on the money meltdown that's changing your life. "Folks are very upset about the original bank bailouts. And now I think the administration ... they understand that they have a political problem here, because they have to look like they're in charge, because, otherwise, you get to a tipping point where the public begins to believe that you're part of the problem," said Gloria Borger, CNN's senior political analyst. "And they don't want that to happen because, you know what? They may have to go back to the Congress at some point in the future and ask for more money. So, they have to have accountability and transparency and regulation, or they're not going to get it." Financial adviser Jill Schlesinger pointed out Tuesday that for all the outrage, there is also a big misunderstanding of what the bonuses actually are. "People do not understand that Wall Street people are paid a very low base salary relative to what their total compensation is," she said on CNN's "American Morning." Bonuses on Wall Street, she noted, are a part of the pay structure, while bonuses in other industries are viewed as a reward. According to a Pew Research Center poll out Monday, 87 percent of Americans are bothered by the bank bailout. The same poll showed Obama's support at 59 percent, 5 points lower than last month.